I'm busy. I'm sure almost everybody skimming this post can relate. This time of year is especially exhausting; three birthdays in the span of a week, back to school for all three kids, soccer for two, birthday parties to plan. Not to mention all the daily stuff that life brings. So it's no surprise that my to-do pile could only be described as the leaning tower of paperwork. I think it's height now surpasses my youngest. The other day I split it into three piles to try and make myself feel better. It didn't work. One of the things on that pile was a vial of test strips. I needed to put a call into One Touch because these strips were reading dangerously wrong. Like over 100 points over the actual BG. Once I tested Elise and her meter said 230. She was actually 108. Thank goodness we have the dex and I didn't correct off of that number. Because we discovered the bad strips during a very busy time for us, I put the vial aside for when I had time to deal with it. Because we all know that when we call companies about our supplies, they answer promptly and never make you wait on hold for 45 minutes. One afternoon, when Elise was in school and the boys were napping, I tackled the pile and came across the strips. They had expired in July and it was now August, but I didn't think it would be an issue. When I got customer service on the line, I reported the issue and asked if they were the same lot number on some other vials I had called about a few months earlier. Turned out, they were. Towards the end of the call, I asked about them replacing the vial of strips, which were a 50 count. The guy said that because they expired, that they wouldn't. I argued that they were not expired when I used them and he replied that I should have reported them when I called about the other lot numbers. To which I replied that the person never asked me if I had any others and I didn't think to look. Gee, how very generous One Touch. You replaced a weeks worth of test strips with a one day supply. Nice opportunity to try a new meter. Or does your insurance cover One Touch the best? I am in love with the freestyle lite meter. So little blood! Nightlight! No errors! You've probably done this, but you might have had better luck with your pharmacist. 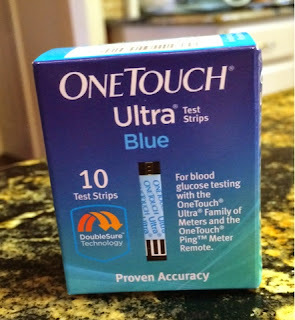 I see a specialty diabetes supply pharmacy and they have given me at least $100 in test strips at times that were going to go out within 2 months, but I easily used them up prior to that. They might have replaced them for free. Freebies are always great! But agreed, OneTouch is obnoxious to deal with.